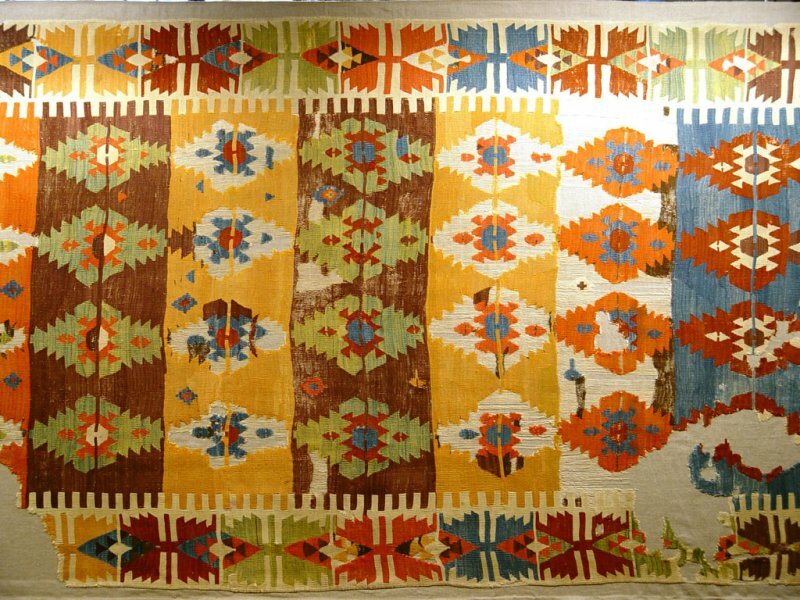 Large kilim. Probably from the Konya region. Vertical rows of rhombs, each containing an ‘akrep’-motif (Scorpion) in their center, set on different coloured backgrounds. The ‘akrep’ motif is used as a protection against the scorpion. A ‘kilim’ is a kind of flat tapestry-woven carpet. When the end of a color boundary is reached, the weft yarn is wound back from the boundary point. Thus, if the boundary of a field is a straight vertical line, a vertical slit forms between the two different color areas where they meet. For this reason, most Turkish kilims can be classed as "slit woven" textiles. Slits produce very sharp-etched designs, emphasizing the geometry of the weave. Weaving strategies for avoiding slit formation, such as interlocking, produce a more blurred design image. The weft strands, which carry the visible design and color, are almost always wool, whereas the hidden warp strands can be either wool or cotton. The warp strands are only visible at the ends, where they emerge as the fringe. This fringe is usually tied in bunches (and sometimes into more elaborate structures), to ensure against loosening or unraveling of the weave. Sources: ‘Kilim catalogue’ – Güran Erbek (DÖSÍM - Kültür Bakanlığı/Ministry of Culture) & Wikipedia.